Little Lady Luxury: Gwen Stefani by OPI :) Can't Wait! Gwen Stefani by OPI :) Can't Wait! The OPI and Gwen Stefani 2014 collaboration set has had its press release! I really hate posting about these things, but this one I'm actually excited about. Looks like an interesting collection! I'm not going to bore you with a bunch of words. I'll give you the pictures and an exerpt from the press release explaining the colors. Enjoy! 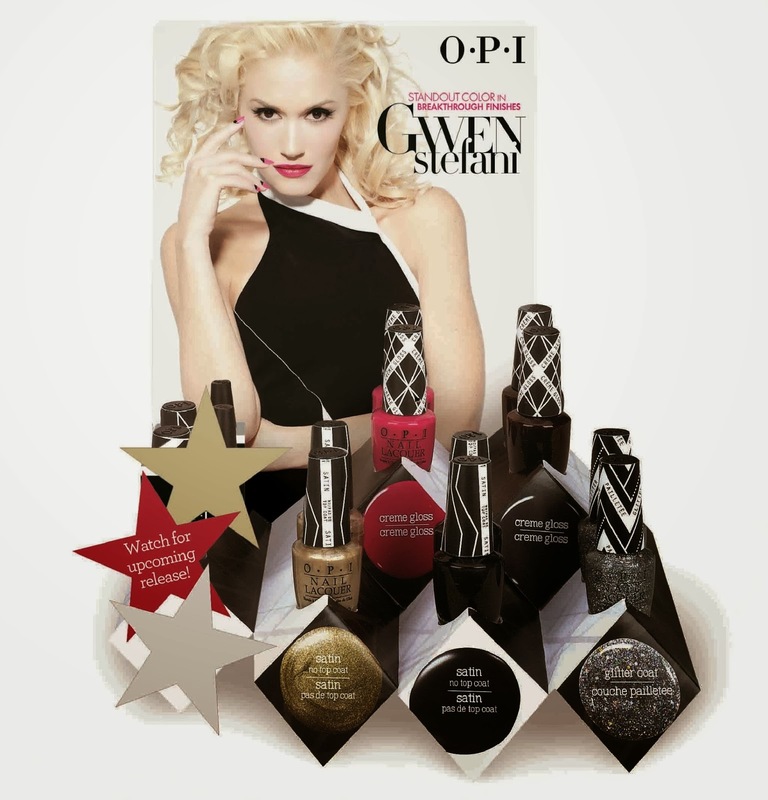 "Gwen’s signature red OPI hue – Over & Over A-Gwen – is available in a boxed set, which includes Swarovski black crystals and silver, gold and pewter studs in bar, square, diamond and circle shapes for creating unique nail designs, as well as nail glue for easy application. Love.Angel.Music.Baby. and 4 in the Morning feature a new, semi-matte satin finish designed to be worn without top coat. Push and Shove, a bold chrome hue, is also worn without top coat but requires a special complimentary base coat – Lay Down that Base. One thin coat of Lay Down that Base topped with two thin coats of Push and Shove yields an intense, mirrored finish. The collection is rounded out with two glossy crème lacquers and one sparkly glitter shade: Hey Baby, I Sing in Color, and In True Stefani Fashion. Gwen Stefani by OPI includes the following seven limited edition nail lacquers: Hey Baby, I Sing in Color, Love.Angel.Music.Baby., 4 in the Morning, In True Stefani Fashion, Push and Shove* and Over & Over A-Gwen**."